Get all the details here!! These options allow for quickly running more than one thing at a time without the need to make a compound target or module. Of course, making a compound file is the recommended practice, especially for targets and modules you plan to run on a regular basis as it is easier to choose a single, compound target or module to run vs. specifying them all on the command line. Automatic updates of the core packageNew in this version is the inclusion of a PowerShell script, Get-KAPEUpdate.ps1, that compares the local version of KAPE with what is available online. If an updated version exists, it is downloaded and the local installation of KAPE is updated with the new version. When a new version is posted online, it will contain all available targets and modules from the public KAPE GitHub repository, found here, that contains all available Target and Module configurations. The next option we will look at was written to assist in keeping KAPE up to date with changes to targets and modules between releases.Automatic syncing with GitHub repoTo help keep targets and modules up to date, a new option, --sync, has been added to KAPE. By default, using --sync will update all targets and module configurations with what is available on the GitHub repository. 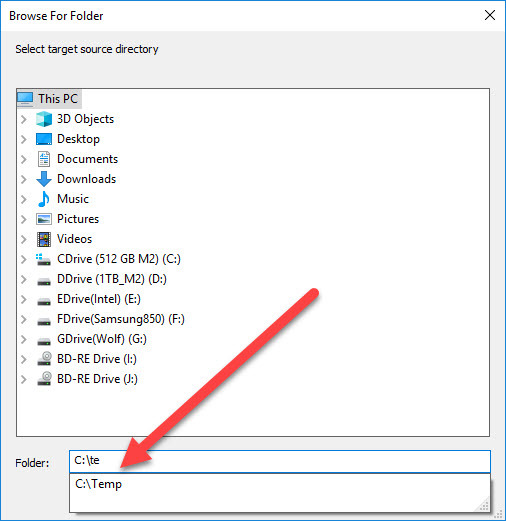 The default is to overwrite all existing files with whatever is on the server, but there is another option you can use to disable this, --sow. Since --sow is true by default (sow stands for 'sync overwrite'), if you want to disable overwriting, you would use --sync --sow false. Here is an example of what this might look like. Notice that KAPE reports both updates and changes to existing configurations. When KAPE compares existing configurations, the SHA-1 is used to determine if the local files are the same as the remote files. 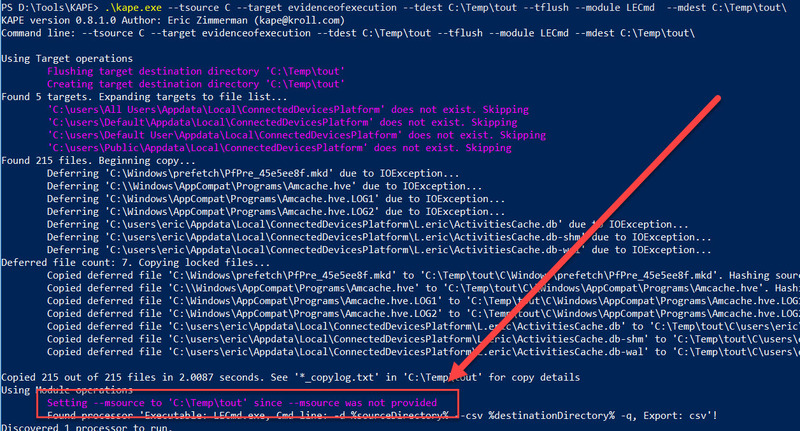 If overwriting is disabled via --sow false, any updated configurations would be reported as having an update available but skipped since overwriting is disabled. 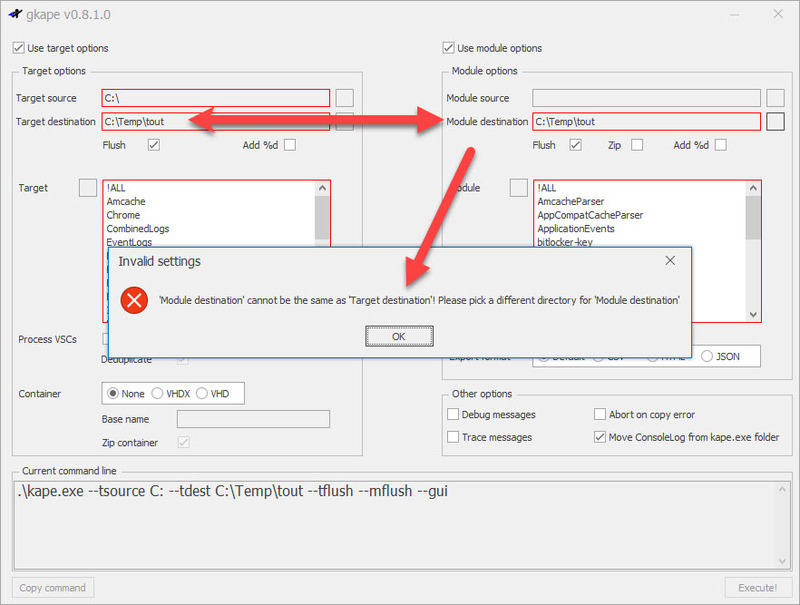 Using this option allows you to stay current with the most up to date target and module configurations. For modules, it is of course still necessary for you to place the proper binaries where they belong before using the modules. This allows you to pass things in like computer names, IP addresses, or anything else you need without me having to add explicit support for every variable. Keys and values should not contain spaces. Usage is generally the same, but all of the new KAPE command line options are also available in gkape. as the gkape window is resized, the grids for Targets and Modules expand, allowing you more space to see the details related to configurations. All of the source and destination boxes now allow free-form typing. Each of these also remembers the previously entered items which allow selecting from a list on subsequent gkape runs. To remove an item, click the X to the left of the value you want to remove in the drop down. For Targets and Modules, a grid is now displayed that shows the Name and Description (and Category, for modules) of each configuration. 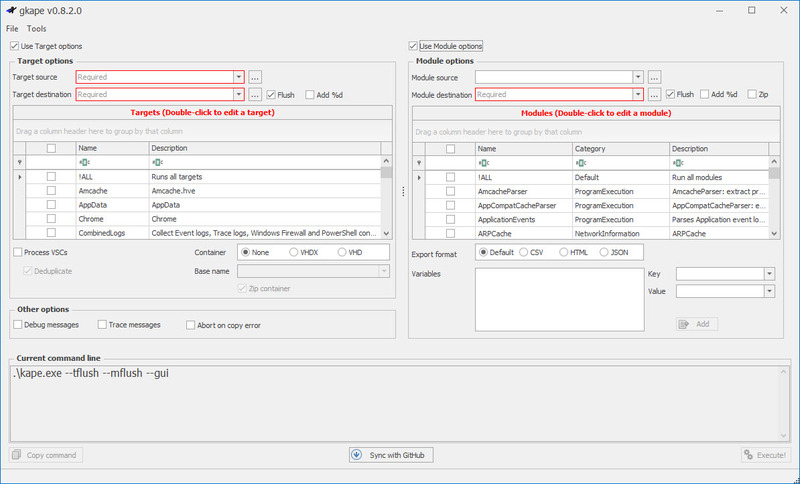 The checkbox to the left lets you select more than one target or module to run. The grids also allow for filtering and grouping, so finding all ProgramExecution modules becomes very easy for example. On the modules side, adding key:value pairs is supported via the Variables section at the bottom of the Module options section. To remove an item, click it, then press the DELETE key. A button to Sync with GitHub was added to the bottom of the interface. KAPE can be updated from the original link you received when you signed up. To get KAPE for the first time, go here! Enjoy! TL;DR:Use the same URL you were emailed to download the update! Let's explore some of these changes, shall we? New checks addedFor some reason, several people were doing some interesting things with the various source and destination paths. You almost always want --msource to be the same as --tdest, so that KAPE can process all the files it just found. Another interesting observation was people wanting to set --tdest to be the same as --mdest while using the flush options. This essentially was telling KAPE to collect to a directory, then delete that directory prior to processing the collected files. Of course, this would not work since all the files were just deleted! Now KAPE detects this and warns you before exiting. GUI tweaksgkape was also updated to make things a little nicer, including updated path selection dialog boxes and some of the safety checks described above. Here we see the warning about setting the destination directories the same. 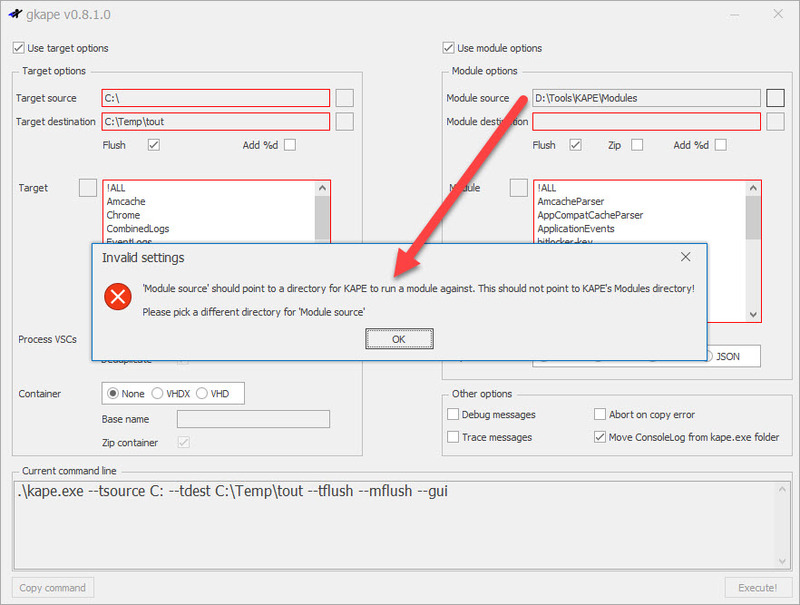 KAPE clears Module destination after the OK button is clicked. The other change in the GUI is that the command line will only have double quotes around strings when they contain spaces. This makes things a bit tidier. EULA clarificationsThe initial version of the EULA was too restrictive in who can use KAPE. Section 1.3 has been updated, including removing the language about people using KAPE as it relates to professional services. If you have any questions on this, please email kape@kroll.com and we can get them answered ASAP. PLEASE UPDATE ASAPAgain, you can get the update right now by clicking the same link you used to initially download KAPE. If this is your first time seeing this, you can download KAPE here.